He is very keen to make contact with any former scouts who were in the group in the 1940s, 50s, 60s or 70s, who are still living in the local area and would be willing to chat about their memories. Readers may remember meeting at the Scout Hut on Rose Hill (now a private house) or helping with the group’s successful fundraising jumble sales. Mike also wants to try and find a family with a four-generation link with 1st Lickey. The eventual aim is to publish the group’s history online. 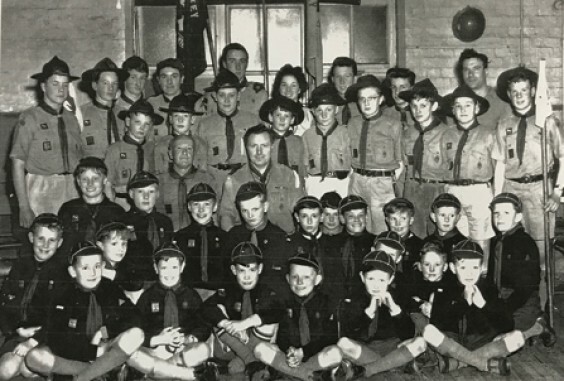 Above: The Scout pack in November 1961, with Scoutmaster Howard Squire in the centre. Mike tells us that Howard lived on Rose Hill and was a WW2 Spitfire pilot (although he spent much of the war in a POW camp). He was a teacher before and after the war. His wife was also a teacher, at the C of E infant school at the top of Rose Hill – this building became the Scout Hut from the 1950s to 2005.